Don’t call it a comeback. Wait check that, this is the one time you can label a general news item or top ten list as a comeback. Pride Never Dies, WEC Never Forget, Strikeforce something, something and never count out one human versus another human in MMA. 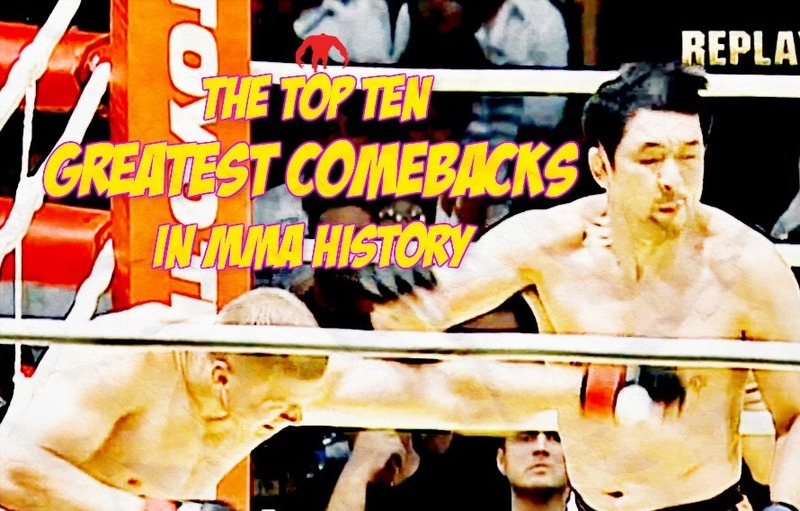 Here are The Top Ten Greatest Comebacks in MMA History. When brute force strength meets sheer talent. Bob Sapp was heading into this fight undefeated. I’m afraid his 0 had to go. Watch as MMA pioneer Kazushi Sakuraba gets brutally assaulted for 5 minutes. It’s not until Sakuraba sees the white light of heaven that he decides to fight back. A fight that brought Joe Rogan to tears. Watch as Darren Elkins gets cut to smithereens on the ground, he then proceeds to make a comeback to shock the world. Absolute chaos. Cheick Kongo was sent to hell and he came firing with fury. Whenever I’m going through the darkest periods of my life I’ll rewatch this fight and it’ll bring me joy. My personal favourite moments in MMA history. It amazes me how this fight wasn’t stopped in the 1st round. Brock receives a sizeable portion of CTE in the first round, then turns the tide and manages to pull an arm-triangle off in the 2nd round. Sorry in advance for the horrific music. Frank Trigg got choked out in the first fight and it led to a bitter rivalry between the pair. There was a lot of trash talking going on between Hughes & Trigg. Dana White says this is his favourite MMA event. Trash music strikes again. This is a weird pick, yet hear me out; Rogers was at the time working in a tyre replacement store. He was a journeyman who just happened to find himself in a fight against the Greatest of all time. Rogers was dominating the fight until Emelianeko decapitated him, thus shattering Rogers hopes and dreams. Don’t feel too bad as Rogers was later arrested for domestic abuse. Anderson Silva was a gigantic favourite heading into this fight and for good reasons; he was (14-2) and was making his big screen debut at Pride. Ryo didn’t buy into the ‘spiders’ hype, he won the fight via (Flying scissor heel hook), yes that’s a real thing.